For over a century and a half, folks searching for just the right synonym to express an idea would reach for a thesaurus, which is essentially a well-indexed book containing lists of related words. The problem has always been (and continues even with today’s popular Web-based versions) that it’s all too easy to use the wrong word in the list. For instance, suppose you were writing the sentence, “The child touched the dog.” Looking up “touch” in a traditional thesaurus, the list of synonyms would include “abut,” “tag,” “kiss,” “verge,” “hint,” etc. In other words, with no guidance or understanding of the nuances involved, many people have ended up looking quite silly or even saying the direct opposite of what they meant. Subscription-based Web tool Visual Thesaurus ($3/month or $20/year) sweeps away these problems. The Visual Thesaurus's dynamic graphical interface shows relationships among words. It changes when you click on a word, and provides popup definitions and usage examples. Color dots tell you at a glance if the group of words are nouns (red), verbs (green), adjectives (yellow) or adverbs (purple). Hover over one of those dots, and a pop up gives both a quick definition and an example of how the indicated group of words might be used in a phrase or sentence. For instance, one group of related words connected to “touch” are “soupcon,” “mite,” “pinch,” and “hint.” Their pop-up definition is “a slight but appreciable amount,” and the example is “this dish could use a touch of garlic.” With Visual Thesaurus, the nuances among words are clear. To the right of the graphic are lists of definitions of words on the graph, grouped by word type. Hover your cursor on the definition, and the definition will pop up on the related branch of the graph. 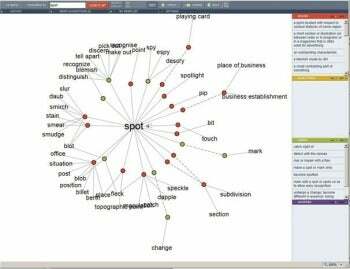 You can also filter your Visual Thesaurus search, according to the word type you need – noun, adjective, verb or adverb.